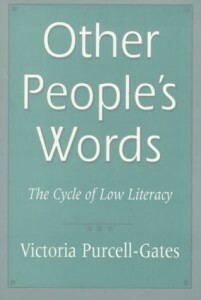 Literacy researcher Victoria Purcell-Gates contrasts oral and written language according to linguistic form and communicative use. To grasp the significance of the emergent literacy research, one must understand a basic tenet: written language is not simply oral language written down. We do not learn to read and write speech. We learn to read and write written text. Close linguistic study has revealed what most of us intuit. Written language is different from oral language. Related, but different. These differences can be appreciated if one transcribes true speech; not speech that is written to be speech but speech as it occurs. … True speech is so hard to “write” that rendering a faithful transcript is extremely difficult. The tendency is to “hear” the language as it would be written, without the hesitations, fragmentations, repetitions, and so on. Written speech is also extremely hard to “read.” One cannot “follow” it; comprehension is difficult. The typical reaction to the task is “You had to be there.” And this is true, because speech, or oral language, is used in situations in which both communicative partners are present. They can see each other, read the other’s body language, hear the intonation of the speech stream, question and challenge, ask for clarification. Oral language is employed within a shared physical context. Written language is the opposite. It is used under the assumption that the two communicants—the writer and the reader—will not share the same physical space when the writing is read. The simple truth of this pragmatic statement is revealed whenever we find ourselves in the uncomfortable position of “listening” to a piece of writing being read, such as at a professional conference or at a meeting. Members of an audience tend to “fade out” whenever a speaker begins to read a paper to them; it is too hard to “follow”; comprehension is difficult. We want the speaker to “speak,” to “tell” us what she or he says in the paper. If we had the paper in front of us, we could read it and understand it. We simply find it difficult to comprehend when it is delivered orally. It is as if speaking goes with listening and writing goes with reading. And in fact they do. Written language differs from oral because we use it to accomplish different tasks—for different purposes. We use it to communicate across time and space. We use it to make permanent a thought, an argument, a story, an emotion. And because language is shaped to suit its purposes, we can look at features of both oral and written language as markers of the type. Some of these markers seem to be related to pragmatic constraints, some to differences in composing constraints, and others to issues of “style.” In general, virtually all of us can “recognize” a language sample as “oral” or “written.” This is most obvious when comparing prototypes of each, such as (a) a casual, spontaneous conversation and (b) an academic paper. I predict, however, that most of us could distinguish oral from written even when presented with language samples that tend to share many of the same functions and features, such as (a) a telephone conversation with a good friend and (b) a personal letter to the same friend. Markers that we use to distinguish between oral and written language include vocabulary, syntax, and reference conventions. Written language tends to employ vocabulary items that have been termed “literary” as opposed to “colloquial,” for example, entrance rather than door and employ rather than use. The syntax in written text—including simple children’s stories—is more embedded and often transformed. … Finally, within written text, only endophoric references are allowed. Writers may not use a personal pronoun, for example, without providing a referent for it within the written text and clearly retrievable by the reader. Speakers can use a pronoun without a referent because they can point to, or by intonation indicate, the man or woman who is being referred to and who literate society learn many important concepts about written language before they begin school. As an emergent literacy researcher, I sought to explore the particulars of this statement. Do all children learn the same concepts, in the same way(s), to the same extent?